Difference between revisions of "NB XWIN"
The SELinux X-Windows (XSELinux) implementation provides fine grained access control over the majority of the X-server objects (known as resources) using an X-Windows extention acting as the object manager (OM). The extension name is "<tt>SELinux</tt>". 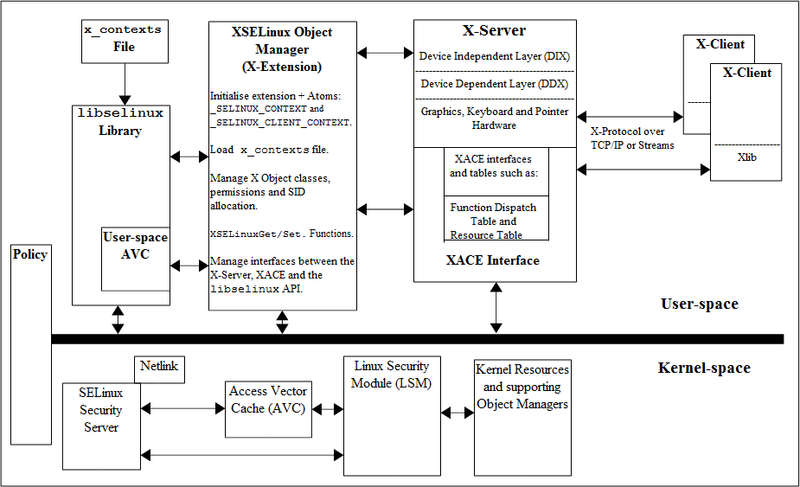 This Notebook will only give a high level description of the infrastructure based on the [http://taiga.selinuxproject.org/~rhaines/NB4-diagrams/23-x-server.png X-Server and XSELinux Object Manager X-Server and XSELinux Object Manager] diagram, however the "[http://www.nsa.gov/research/_files/selinux/papers/xorg07-paper.pdf Application of the Flask Architecture to the X Window ][http://www.nsa.gov/research/_files/selinux/papers/xorg07-paper.pdf System Server]" paper has a good overview of how the object manager has been implemented, although it does not cover areas such as polyinstantiation. This Notebook will only give a high level description of the infrastructure based on the [http://selinuxproject.org/~rhaines/NB4-diagrams/23-x-server.png X-Server and XSELinux Object Manager X-Server and XSELinux Object Manager] diagram, however the "[http://www.nsa.gov/research/_files/selinux/papers/xorg07-paper.pdf Application of the Flask Architecture to the X Window ][http://www.nsa.gov/research/_files/selinux/papers/xorg07-paper.pdf System Server]" paper has a good overview of how the object manager has been implemented, although it does not cover areas such as polyinstantiation. The X-Windows object classes and permissions are listed in the [[NB_ObjectClassesPermissions#X Windows Object Classes | X Windows Object Classes]] section and the Reference Policy modules have been updated to enforce policy using the XSELinux object manager. : '''The Policy''' - The Reference Policy has been updated, however in Fedora the OM is enabled for mls and disabled for targeted policies via the <tt>xserver-object-manager</tt> boolean. Enabling this boolean also initialises the XSELinux OM extension. Important note - The boolean must be present in any policy and be set to <tt>true</tt>, otherwise the object manager will be disabled as the code specifically checks for the boolean. : <tt>'''libselinux'''</tt> - This library provides the necessary interfaces between the OM, the SELinux userspace services (e.g. reading configuration information and providing the AVC), and kernel services (e.g. security server for access decisions and policy update notification).